South Korean President Moon Jae-in and North Korean leader Kim Jong Un first met in April in a highly publicised summit and then again in May for more informal talks. Kim Eui-keum, a spokesman for Moon, said that holding the summit before September 10 would be hard due to logistics. 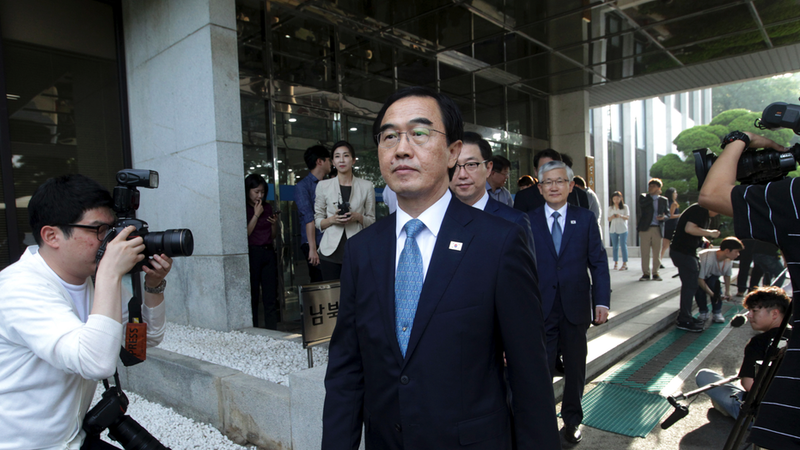 Unification Minister Cho Myoung-gyon is leading the South Korean delegation. The two Koreas held a fresh round of talks at the DMZ on Monday to discuss the third summit. "We'll at time play out a little bit, see how the talks between the North and South today go, and then see what the future holds", Harris said, noting President Moon Jae-in's remarks that the improvement in relations between North and South Korea can not advance separately from the nuclear issue. North Korea is thought to have a growing arsenal of nuclear bombs and long-range missiles and to be closing in on the ability to reliably target anywhere on the US mainland. As The Korea Herald reports, on September 9, North Korea will celebrate 70 years of existence under the regime that was founded by Kim Jong Un's grandfather, Kim Il Sung. Kim and Trump both agreed to "build a lasting and stable peace regime on the Korean Peninsula", while the North Korean leader "reaffirmed his firm and unwavering commitment to complete denuclearization of the Korean Peninsula". The South Korean envoy said he urged Pyongyang to accelerate its current nuclear negotiations with the United States.